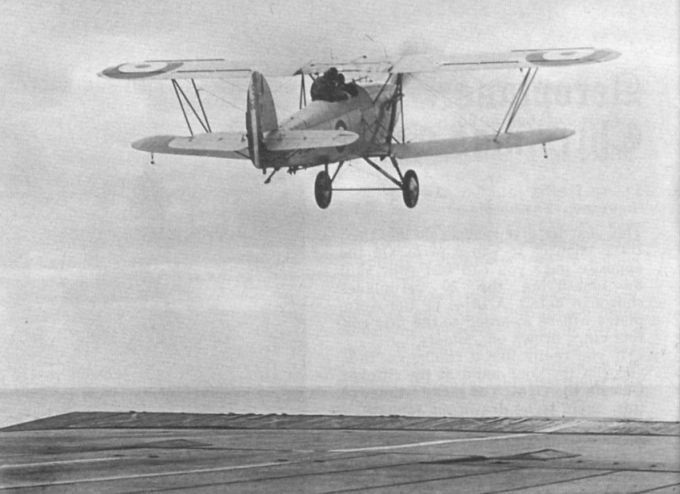 A Hawker Osprey Mk I, serialled S1687, and possibly with No 404 Flight aboard Courageous, takes off with "Skins" and "Harvey” in the cockpits. The Osprey was a fleet spotter/reconnaissance aircraft, and deliveries to the FAA began in 1932. Visible in this picture are the interplane jury struts near the wing roots, used when the wings were folded, but often left in position while the aircraft was being flown. 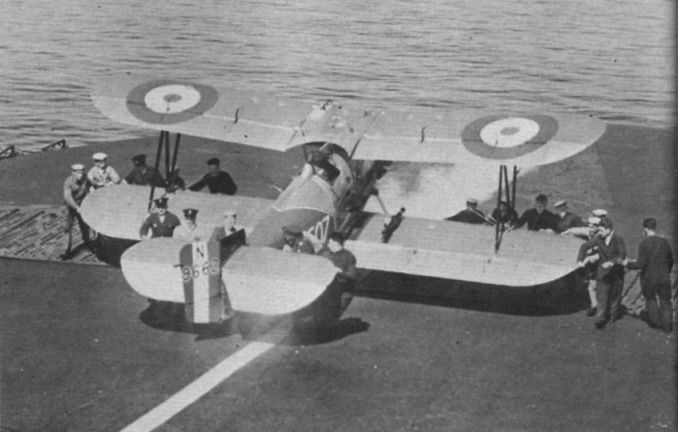 A view of a congested aft deck, with Blackburn Darts, Fairey IIIFs and, in the foreground, a Blackburn Blackburn Mk I in evidence. The unsightly Blackburn was designed for reconnaissance and gunnery fire control, and proved very successful in this role. The engine was a 450 h.p. Napier Lion IIB. The caption "picking up Boozy’s ship", tells us that the unfortunate pilot of Blackburn Dart torpedo-bomber N9817 was none other than Lt Byas, later to become CO of 803 Squadron aboard HMS Hermes and affectionately known by all as "Boozy Byas". 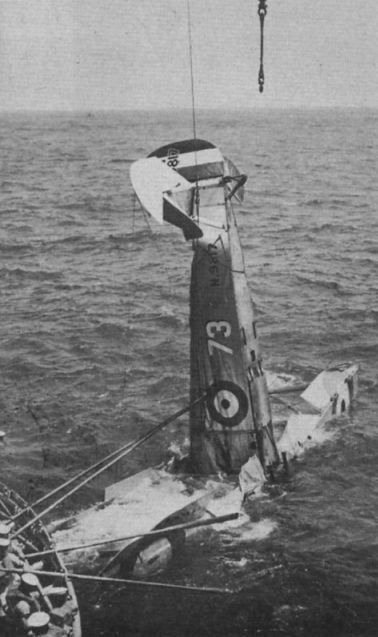 N9817 is recorded as having sunk in the Mediterranean in 1931 - presumably the incident depicted. 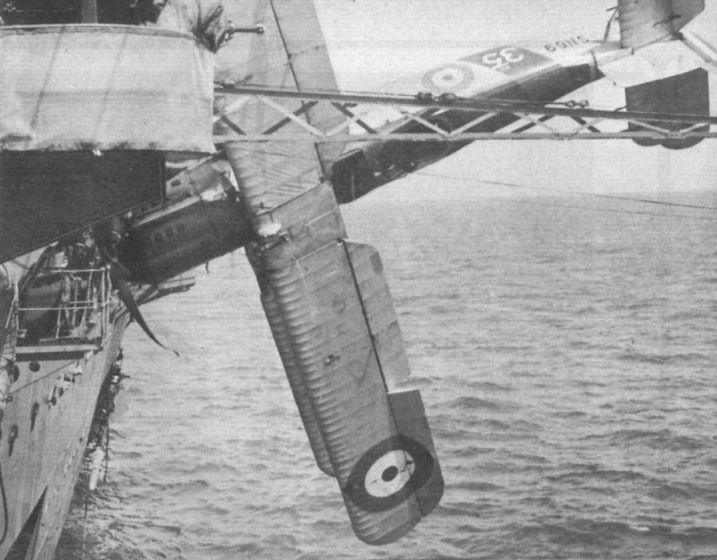 Our friend "Rupert" in trouble again, this time being retrieved after nearly going "over the end" in Fairey Flycatcher N9662, possibly with No 801 Squadron aboard HMS Courageous in 1930. The Flycatcher was a single-seat fighter powered by the 400 h.p. Armstrong Siddeley Jaguar IV radial engine. Note the camera gun on the starboard lower wing in this picture. 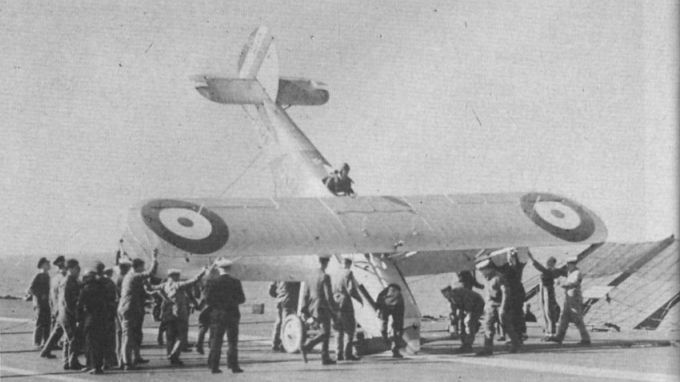 Captioned "Rupert on his nose due to arrester cable breaking, Malta 1932", this shows Hawker Nimrod S1624 of the second production batch, probably with either No 800 or No 801 Sqn aboard Courageous. Powerplant was a 477 h.p. Rolls-Royce Kestrel lls in-line. Fairey IIIF Mk IIIB three-seat spotter reconnaisance aircraft S1486, c/n F1329, heads for the nets at a pace. The pilot is identified as "Rupert Hogan”. This view illustrates the revised, rounded fin and rudder fitted to later variants of the type. The IIIB was of all-metal construction, strengthened for catapulting and powered by a Napier Lion XIA of 570 h.p. Fairey IIIF Mk I S1169 in a precarious position after going over the side and into the nets. The pilot was one "Johnson". Powered by a Napier Lion VA, the Mk I was the initial production version, having a metal fuselage, wooden wings and a horn-balanced rudder.